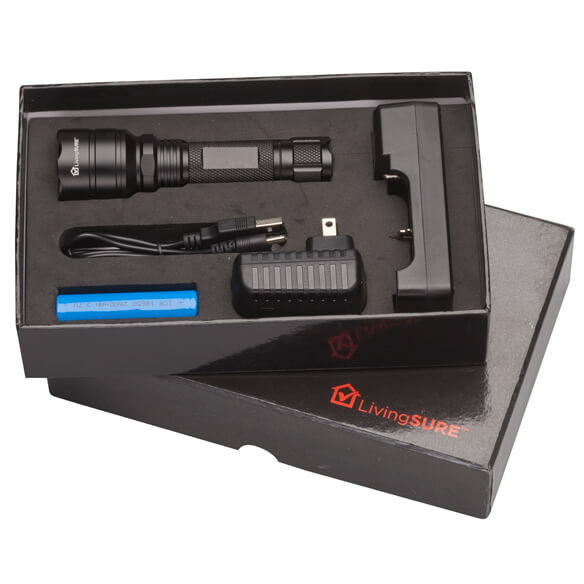 Compact, yet powerful, this 5" Tactical Flashlight with Rechargeable Battery by LivingSURE™ is crafted of military-grade, engine-turned aluminum with tactical features similar to those used by military and law enforcement personnel. Its scalloped striking crown can be used to break glass or for self defense in emergency situations. 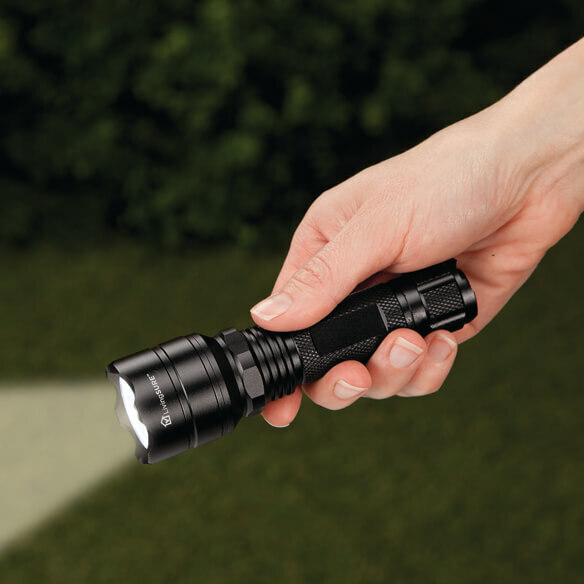 Easily changing light functions, a simple touch of the LED flashlight's rapid response tailcap switch offers quick access to high, medium, low, blinking and SOS light modes. Powerful CREE-XML-2 LED bulb capable of reaching up to 500 Lumens. 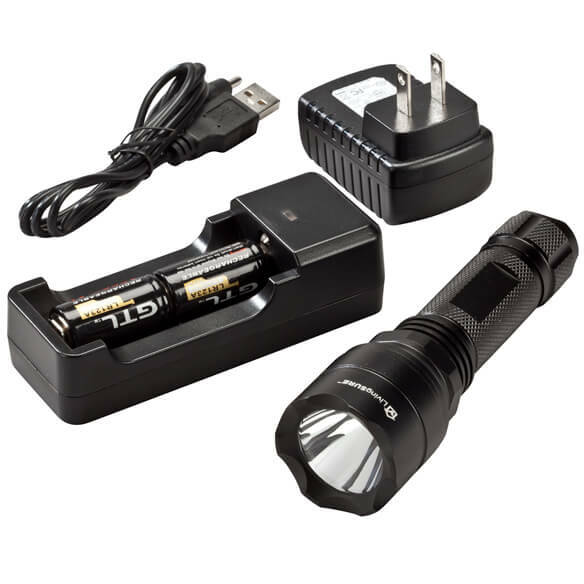 Rechargeable flashlight battery will last 3 1/2 to 4 hours of constant use when fully charged. Engraved with our exclusive LivingSURE logo. Includes battery charger (USB/wall adapter) and gift box. I bought one for me and one for my daughter recently. They are amazing so I'm getting one for 5 friends. They are as good as a tactical flashlight that I bought for about $50 or $60 and requires new batteries often. This one comes with a rechargeable battery. Love it. For walking dog after dark. As a backup when there is an emergency. 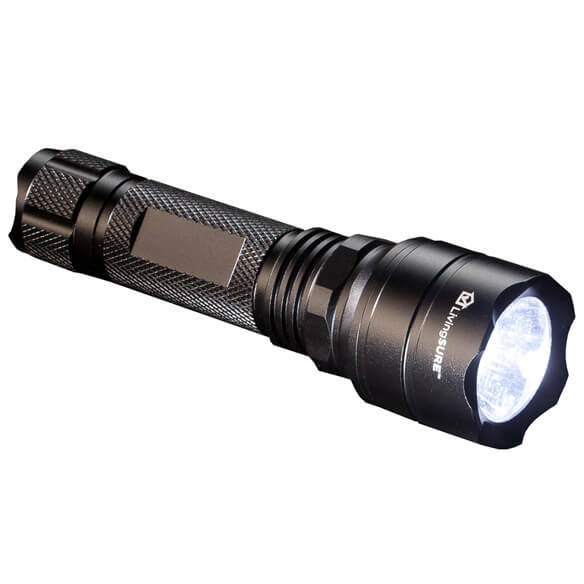 It is bright at 500 lumens, rechargeable w/ approximately 750 recharges. This flashlight is amazing. So far I've bought 7 and gifted 6 to friends. Eventually the battery will probably wear out and not take a charge. Are there additional batteries available? BEST ANSWER: Thank you for your question. We do not sell the batteries for this flashlight. We hope this information will be of help to you.